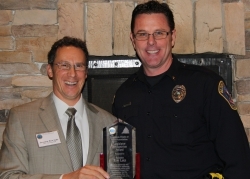 For his leadership in devising and implementing solutions to several critical public safety issues during the 2015 legislative session, the Minnesota Chiefs of Police Association (MCPA) presented Sen. Ron Latz (DFL-St. Louis Park) with its first-ever Legislator Recognition Award. 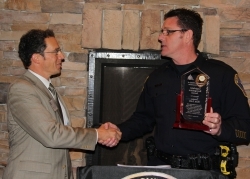 The ceremony took place Thursday, November 19, 2015 at an afternoon luncheon at St. Paul’s Downtowner Wood Fire Grille with nearly 30 law enforcement leaders representing agencies large and small, rural and metro. “On behalf of the MCPA’s 320 voting members, we are grateful for Senator Latz’s leadership and commitment to addressing and advancing public policy that directly impacts public safety in communities across Minnesota,” MCPA Executive Director Andy Skoogman said. Senator Latz, Chair of the Senate Judiciary Committee, was the chief author of legislation that provided Minnesota agencies clarity for the use of Automated License Plate Reader (ALPR) technology, an important, emerging tool that is used to recover stolen vehicles and track down suspects in more serious, violent crimes. “Senator Latz’s efforts helped produce an ALPR law that properly balances privacy concerns with law enforcements’ ability to investigate and solve crimes with this new technology,” said Bloomington Police Chief Jeff Potts, co-chair of MCPA’s Legislative Committee. Senator Latz also helped pass a bill that addresses the growing demand for body-worn cameras, and, as the chief author of the Public Safety Finance Bill, he prioritized funding for Crisis Intervention Training. The training will allow the state’s law enforcement agencies to better respond to the increasing number of mental health related calls. In choosing nominees for the annual Legislator Recognition Award, the MCPA considered those state and federal lawmakers who authored or supported important legislation that addresses the priorities of the MCPA’s Legislative Committee, displayed a desire to better understand and take action to solve the public policy challenges of law enforcement and developed a thoughtful and persuasive argument that shapes the public narrative around an important issue facing local or national law enforcement.